It has now been endorsed by Environment Secretary Michael Gove, Earth Day in Washington and most recently the EU Commission’s Helmut Maurer in Brussels. In his supporting film, Gove said that #StirCrazy is ‘absolutely right’ in its campaign. And the Earth Day Network’s VP for Global Earth Day, Valeria Merino, said: “The #StirCrazy campaign is in complete alignment with Earth Day’s theme and campaign for 2018 End Plastic Pollution. The list of support grows and as our campaign builds momentum in government, NGOs and businesses. But what is the campaign, and why is it so well endorsed? At the heart of the campaign is the question ‘why?’. Why do we produce, store and then stir our drinks with a bit of plastic? Stirring for only four seconds with something that lasts for centuries. Why, when there are simple, and as economical, alternatives available? The big brands are now taking notice. Nisbets, one of Europe’s largest catering equipment supplier, has agreed to delist plastic coffee stirrers and encourage customers to use sustainable alternatives with immediate effect. Richard Cromwell, commercial director at Nisbets, said: “By delisting plastic coffee stirrers and replacing with FSC beech wooden stirrers we are able to contribute to the #StirCrazy Campaign immediately." Costa Coffee have also pledged its support. A spokesperson for the brand said: “For nearly a decade Costa has not used plastic stirrers but instead only offers sustainable sourced wooden stirrers to our millions of customers. “We are very supportive of the #StirCrazy campaign and look forward to the difference it will make”. We now expect other announcements from Starbucks and Pret a Manger. While #StirCrazy is aiming for the total eradication of plastic stirrers across the world by 2020, it does have three simple first year objectives. With the UK government's recent announcement, it seems that one of those objectives will be met – to have one national government declare a tax cost covering stirrers, or tax incentives to make alternatives (metal tea spoons, bamboo, or FSC-sustainably sourced) more economically attractive. It is great that May and Gove are now walking like they are talking and doing something about the worldwide problem of plastics in the environment. Now it is up to other countries to follow this lead in questioning all of our single use plastics. Now let’s make sure they keep walking in this direction. 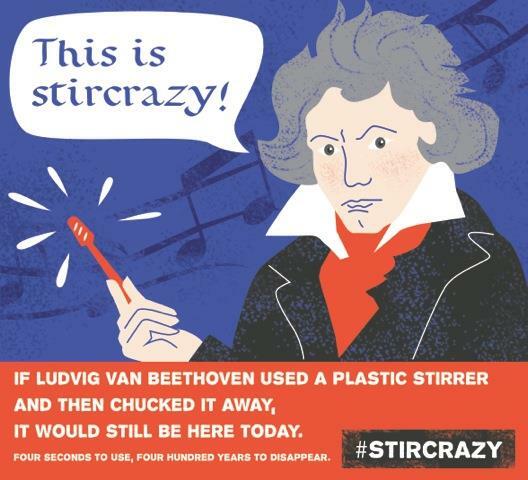 #StirCrazy’s campaign slogan 'Re-think your use of plastic – don’t stir with it!' is just the beginning of challenging all single use plastics, and, rather than provoking the “raging plastics waste debate” that Maxine Perella has discussed in RWW here, we are focussing on the tiny plastic stirrer, billions of which are produced and discarded every year. To sign the petition, click here. Let’s stop this #StirCrazy-ness. Luke Douglas-home is founder and CEO of social enterprise Clear Public Space.